Western Welsh buses ran in a maroon livery however this smart blue and ivory was applied to coaches for a period. OUH 177G is a preserved example of the Leyland PSU3A/4RT (900597) with Plaxton Panorama Elite C49F coachwork (693263). The batch of six delivered in April 1969 were fitted with a five-speed semi-automatic gearbox and two-speed rear axle. This one is seen at the 2016 Swansea Bus Museum Running Day. I’m surprised nobody else has commented, Les. Very nice view, and thanks for posting. I’ve been doing battle with my computer system [going back to a Windows machine from an Apple] otherwise I would have commented before. It’s very pleasant to see a Western Welsh coach in "proper" colours rather than the white paint carried by her sister 176G, which I had published one these pages some while ago. I have attached a photo of Western Welsh WKG 138, an AEC Reliance 470 with a Weymann C39F body new in May 1961. It was on hire to PMT in May 1970 along with several others of the batch and is pictured outside Stoke No 1 Garage. I think this body style was unique to Western Welsh and (to my mind) could hardly be described as attractive. Hope this is of interest. Ian, you described the looks of WKG 138 very tactfully, although it does have its charms despite (to my eyes) looking somewhat like a frog wearing safety goggles. It must be admitted that 177 certainly leaves it standing in the beauty stakes though. The Plaxton coachwork looks simply stunning in Western Welsh’s cream and blue livery. Interesting that the Company chose blue rather than red or maroon for the coach livery. I wonder what the reasoning behind it was. Its a shame that they had to bend the windscreen panels to fit them in. Brendan, I believe that "powder blue" was the livery of WWOC’s predecessor South Wales Commercial Motors – although why WWOC decided to adopt it as their coach livery . . .
Brendan’s description "a frog wearing safety goggles" is brilliant ! I can see exactly what he means. Thanks for the information Philip. It’s certainly an attractive shade, especially when matched with cream/ivory. I was never lucky enough to drive an Elite like this – when I started PSV driving in 1979 it was Supremes that we had at Salopia and then Shearings. But when I did my HGV training at Bassetts at Stone in the 1990s they still had a few Elites older than this one (ISTR a "D" registered one at least) running around on schools contracts. I asked if they would sell me one but they said "no" on the grounds that with them being 45 instead of 53 seats, they were easier to turn into school driveways. But out of interest, where would anyone go (apart from eBay) to find something like this for sale these days. I’d love to have my own old "Plackie" to go on day trips out. Eric – your best option is probably to buy a copy of "Bus & Coach Preservation" and keep an eye on the adverts section. It is published monthly, and I think that Plaxton Elites come up occasionally (I cannot see any in the current issue). To the best of my knowledge, the earliest Elites were G-suffix registrations. I’m not an expert, but my understanding is that the structure is not always as good as the vehicle might look – and certainly not as solid as an ECW body! The Western Welsh blue and royal ivory coach and DP livery was actually quite short lived. It first appeared in 1965, and all new coaches and DPs delivered from 1965 to 1971 were delivered in it, as well as the 1972 coaches. Older vehicles were repainted in the blue/ivory during that period, but by 1972, the company had reverted to dark red and cream for DPs. Towards the end of the period, the fleetname was replaced with a large block lettered variety. I seem to recall reading that the shade of blue was known as "peacock". I have just bought a J reg Elite. Certainly they were renowned for drooping behind the rear axle and mine was no different. 60 man hours and some steel later all sorted and MoT obtained. When you refer to the solidity of ECW body designs, Nigel, I assume that you do not include the B51 in that description, though much of the blame lay with Leyland. The B51 was designed for the RE, but Leyland decided to fit it to underfloor engined chassis with no proper rear chassis support for the boot area. Well, Roger, I was thinking more of contemporaries to this Western Welsh vehicle, for example the first style of coach body on a Bristol RELH chassis. Those were definitely solid! 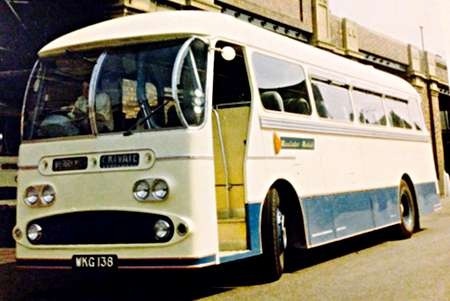 Unfortunately, under Leyland’s influence, and possibly a more general pressure to cut costs, the quality deteriorated in later years, and I have read somewhere that, for example, the second type of RELH coach body was also not as solid as its predecessor. But I agree, the B51 was poor – perhaps, the exception that proves the rule! The Elite is most correctly described as the ‘Panorama Elite’ although as time went by the ‘Panorama’ was dropped in everyday speak. The earliest examples were G-reg, restyling seeing the introduction of the Panorama Elite II and Panorama Elite III, the final examples being P-registered. 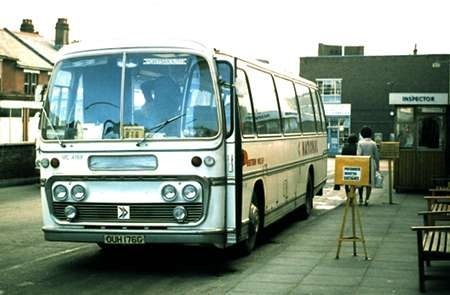 When grant doors etc were specified, the word ‘Express’ was added to the body designation eg: Plaxton Panorama Elite II Express, which probably accounts for the general term ‘Elite’! Here are two views of OUH 176G, a PSU3A/4RT Leopard with Plaxton C49F bodywork new to Western Welsh in 1969. Seen at Southampton Coach Station in March 1976, she’s in NBC white, but there are some interesting features which may help redeem her! While the destination blind is set at blank, there is what looks like a suction pad in the nearside windscreen telling us she’s going to Portsmouth. The sticker says this is the 876. She shows the "Red & White" style of fleet number, UC 4169. The rear end shows that she still has the gold on blue fleetname, with the double N logo on the luggage compartment door. Thanks for your comments. If you mean the actual seat back below the headrests, I think it’s nothing more than shadow from the adjacent wall. Yes, I see that now, Pete. Offside is in bright sunshine and n/s is in shade, an equally silly question is, what is the gobbledegook in the rear fleetname display meant to be? I think the service number is more likely to be 676, which was a daily service from Treherbert to Portsmouth via Cardiff, Severn Bridge, Bristol, Bath, Salisbury and Southampton. Severn Bridge (Aust Services) was used as an interchange point by National Express at that period, with services from South Wales connecting with services to the south coast. The 876 was a weekend service between Liverpool and Paignton. Gobbledegook it isn’t but misleading it can be especially as Western Welsh’s route map extended as far east as the English border in the 1970’s (and over it earlier days). Though I lived in the region for several years I never understood the boundaries of Red & White’s operating area and that of Western Welsh in Monmouthshire. At that time Western Welsh seemed to have more routes in East Monmouthshire than Red & White despite that being the ‘home’ area of the latter. Not that it makes things any easier to understand Orla, but I read recently that, like Western National, Western Welsh referred to the Great Western Railway rather than geography. You may well be right, David W, in saying it’s the 676, but I’ve always read it as 876. Strangely enough, I never saw a vehicle on this service which actually had a service number blind. Some of the Royal Blue fleet had started to have service numbers on their blinds by this time, where it might normally have said "ASSOCIATED MOTORWAYS". I think this has been posted elsewhere on this site. In 1929, the Great Western Railway’s bus services in South Wales were merged with those of a company called South Wales Commercial Motors. A new company, Western Welsh Omnibus Co. Ltd, was formed with a GWR share-holding. This was during the period of large-scale acquisition of bus interests by the railways. My reference to the English Border in earlier days was because I believe that some WW service routes extended as far as Hereford and Gloucester (albeit they may have been joint services). When I lived in the region in the ’70’s they went only as far east as Chepstow (route 63, Blackwood to Chepstow via Usk) and as far north as Abergavenny (route 141 Abergavenny to Newport via Cwmbran). The successors to WW and R&W (National Welsh but branded R&W) did run services from Newport to Hereford and to Gloucester before that company folded and then Stagecoach took over the routes. In the ’70’s R&W ran the service from Newport to Monmouth via Usk (service 60) which was east of the Newport-Abergavenny route and R&W ran the Newport-Blaenavon/Brynmawr via Pontypool routes which were west of the Abergavenny-Newport route but which had been part of WW services in the 1930’s. Monmouthshire formally became part of Wales in 1974 under the local government reorganisation that created Gwent county. Before that there had been a long campaign by, primarily West Mon based, campaigners to have the county included in Wales whilst many in East Mon thought of the county as forming part of England. The present administrative district of Monmouthshire comprises largely the former east Monmouthshire. To bring things up to date, Stagecoach South Wales which took over from Red & White, currently serves The Forest of Dean, Caldicot and services as far as Gloucester and Hereford. In fact, Jim, the Ross-on-Wye-based routes were transferred from Stagecoach South Wales to Stagecoach West in 2000 and are now branded ‘Stagecoach in Wye and Dean’. The 73, which originally went from Gloucester to Cardiff, was cut back to Newport, Chepstow, now only to Lydney. Hereford and Monmouth are still served. Ah Chris, you are forgetting the final twist in the tail of the 73. It was later extended from Lydney up through the Forest of Dean to Coleford and renumbered 23, in which form it operates today. I do miss having a direct bus service from Gloucester to Chepstow and Newport – clearly few others did! Ooh, Rob, I didn’t know that! No wonder I haven’t seen a 73 around Gloucester for a while, now I come to think about it! Stagecoach now runs a 74/X74 Newport – Chepstow via Langstone (74 only) and Caldicot. Newport Transport runs a 73 Newport – Chepstow via Langstone and Caerwent. There is a separate (and infrequent) service between Lydney and Chepstow (James Bevan service 755). Prior to the formation of ‘National Express’, there was a daily Associated Motorways service between South Wales and Portsmouth. Some seasons the South Wales portion started from Aberdare, and others from Treherbert, but it was worked by Red & White’s Aberdare depot in both cases. The vehicle worked south one day and returned the next. When Nat Ex introduced route numbers, it acquired the number 772, but this changed to 676 after just a couple of seasons. Once Nat Ex had become established, and the white livery prevailed, an additional, Saturdays only (at least, initially), ‘flyer’ from Treherbert to Portsmouth was added, which served only the major points, and completed the return trip within the one day. My understanding is that this journey was worked by Western Welsh’s Rhondda depot in Porth, and this can probably be confirmed since UC469 (the number carried by this vehicle prior to October ’75) was allocated to Porth in August ’75. Certainly, I only ever saw WW (or ex-Rhondda) vehicles on this working while I lived in Southampton (up to August 1975). 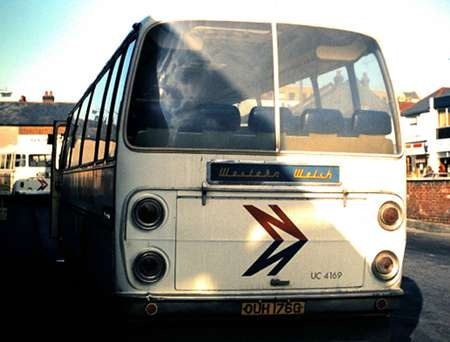 As far as the bus services were concerned, Red & White and WW were not true ‘area agreement’ companies, and significant parts of South East Wales were shared by the two operators. There were, however, a number of co-ordination schemes, most notably in the Monmouthshire valleys, which rationalised the operations when introduced in the mid-1960s. In that case, both companies held licenses for all of the services in the designated area, even though some were only operated by one of the companies. However many of the longer services – e.g. Newport-Brynmawr via several routes or Newport-Tredegar/Merthyr – were operated jointly. There was thus no ‘boundary’ between R&W and WW. In even earlier times it was even more complicated, as R&W had a share of the Cardiff-Barry service, while WW also worked on the Newport-Monmouth service. WW also worked to Hereford (from Brecon – service 739) as well, so they did indeed reach England. The ‘connexion’ between the Cardiff area and Portsmouth also extended to British Rail, who operated a regular service between the two cities, which still runs. My widowed mother used to take in her proportion of the many Welsh Summer holidaymakers, as ‘B&B guests’. I recall when the rail service was Class 33 hauled, these Southern diesel-electric locos working up to Shrewsbury at times, well outside their normal stomping ground! But I digress! 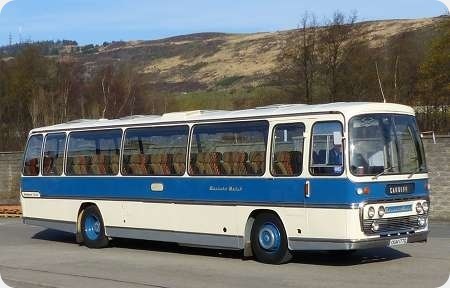 Delivered in 1961 to Western Welsh, WKG 284 is a dual purpose AEC Reliance with Willowbrook body. WKG 284 would last with the company until 1972 when it then passed to Gelligaer UDC. 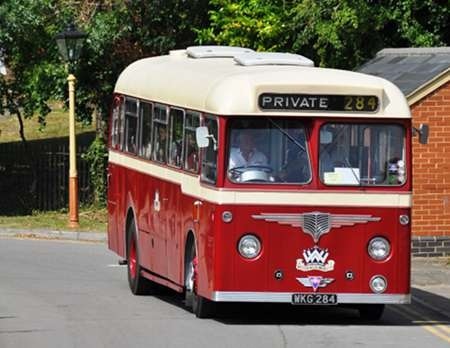 It has been restored by the RE-Liance Bus Preservation Group and was photographed from an open top vehicle arriving at the recent rally at the G & W Railway at Toddington. Yet another beautiful restoration. With the PMT Leopard we also revisited the problems with the AEC wet-liner engines (470 and 590). What needs to be reiterated is that, especially with the 470, the engines pre-dated universal motorway usage and for all their foibles they were sufficient unto the day. AECs virtues always far outnumbered their vices. As David O says, another beautiful restoration, captured admirably by Ken. What has always puzzled me about this operator name was that I only ever saw services in south east Wales, not in the west. I see from that encyclopaedia site that there were operations in Tenby and parts of the West Country in the early days. I suppose they were hived off in the interests of "rationalisation". The "Western" in the company’s name refers to the Great Western Railway who were a major shareholder and contributed their existing services to the Combined operation. The same logic applied to the naming of Southern National (part owned by the Southern Railway), Southern Vectis (ditto), and Western National, plus of course Eastern National where LNER were a major owner. In 1929, Great Western Railway bus services in South Wales were merged with those of a company called South Wales Commercial Motors. A new company, Western Welsh Omnibus Co. Ltd, was formed with a GWR share-holding. Thank you, Neville & Geoff! The AEC 470 engine vehicles didn’t need a motorway to show up problems, David! On service work, minor cylinder head gasket failures, not enough to affect performance, would instantly cause an air lock in the heating system with the inevitable bookings of ‘cold heaters and demisters’. Oh that the cause could be rectified as quickly as the report could be written. The horizontal 470 was the bane of many an operations engineer’s life – wonder if the vertical version was any better? I never came across one to find out. Does anybody know (or care to suggest a reason) why, when Western Welsh elected to display route numbers, they chose yellow-on-black rather than white-on-black? . . . whilst retaining white-on-black for destination blinds? Philip, it’s an interesting question, especially as most indicator displays are now of the dot matrix or led system, and yellow on black. Why, indeed, would Western Welsh have gone the way they did? When, roughly, did they go to this formation? For the latter half of my working life, I was dealing with bus operations in particular but other elements as well, of traffic management in Southampton. Some of that work was dealing with disabled parking bays. One of my colleagues, the signs specialist, observed one day about the need to place a white or silver stripe round some (strangely, not all) sign posts, for the benefit of folk with defective eyesight. According to the manual, for instance, a bus stop pole ‘shall’ be either black or silver. How many of other colours do you see? Quite a lot, especially if operators provide and maintain their own. Some still do! It provided a contrast. This is why many steps have an edge of different colour. One "Circular" he received mentioned the fact that, in conjunction with RNIB, it had been found yellow was an even better contrast, especially at night. A lot of people say they are waiting for "the number 62". They don’t want any others in the range of bus services that might serve a particular part of their town. They want the "62". Could Western Welsh have been among the first operators to realise that the yellow gives a better contrast when prospective customers are looking for a certain number? Could they, perhaps but unlikely, have been the guinea pig operator for testing blinds? No, surely not, as this firm and Red & White had by then been merged into National Welsh. The smaller AH410 revealed the same problems as its larger capacity cousin. The Aldershot and District Reliances repeatedly incurred air locks in the cooling and saloon heating system, due, in no small measure, to the failure of the seals in the wet liners. Driving one of these buses on the very busy Cove services during a wet winter night with ineffective, cold demisters was, almost literally, touch and go insofar as forward vision was concerned. That a firm the size of AEC should prove incapable of producing reliable wet liner engines suggests a significant malaise in the design department. The much smaller Dennis company managed to make trouble free wet liner engines in petrol and diesel forms from the 1930s onwards to the end of its engine production programme. The first AEC wet liner engine was the "bootlace" or A172 motor of 6.754 litres which appeared in 1935, and this design, which had had a reputation for wet liner and gasket failures throughout its life, was the basis for the postwar AEC family of wet liner engines. It now seems incredible that, in decades of development, AEC could never cure the faults. One of our Depot Engineers with quite a number of Reliance 470s on his allocation became so desperate that he acquired two of those windscreen heaters with two rubber suckers used on cars in pre-demister days. These were duly fitted one to each screen of an errant Reliance, wired in series (couldn’t get 24volt versions) in an attempt to warm the cold air being pumped out by the demister and thus provide some degree of windscreen clearing. Not a success!! (but 10/10 for innovation!) Let’s not forget that the Leyland 0.350 fitted to the Tiger Cub etc was not too successful in the head gasket department either, made worse by the use of a single cylinder head. Classy livery and practical too. NBC had a lot to answer for! Western Welsh used yellow route numbers to denote one-man operated services. You probably will, Philip – although that was the original intention, in time it rolled out across the fleet. Seemed a strange way of doing things, but there we are. Western Welsh introduced 3 digit Route numbers in 1959. The first digit identified the depot the route was primarily operated by e.g., 2XX worked by Bridgend 8xx Haverfordwest. The 24 Leyland Tiger Cubs with Park Royal B43F bodies SBO 240 to 263 Fleet Numbers 1240 to 1263 were the first fitted with destination indicators containing number roller blinds. Western Welsh used yellow route numbers from the outset. Services worked by OMO carried a black triangular flap with yellow lettering on the nearside front which could be inverted when working conventionally with a conductor. Western Welsh’s operating territory covered the whole of South Wales and Monmouthshire with the notable exception of Swansea (South Wales transport). At its formation in 1929 the Great Western Railway services were based in Cardiganshire, Carmarthenshire, North Pembrokeshire, Neath, Abergavenny and Brecon. Those of South Wales Commercial Motors were based in Cardiff and Bridgend. Expansion into the Eastern and Western Valleys of Monmouthshire was achieved in 1933 and South Pembrokeshire as late as 1956 with the acquisition of Green’s of Haverfordwest. The only service into England was the Brecon to Hereford 730 service introduced in 1962 following closure of the Rail service and was an extension of the Brecon Hay on Wye service hitherto. I worked as a turner at Ely garage in the seventies, and since then have wondered what the strange type of red the buses were painted was called. Anybody know? Also most of the buses had a diamond painted on their rear showing which depot they "belonged" to. Yellow was Ely, blue either Barry or Bridgend, Cross Keys black. The colour the buses were painted in the 1970’s was National Bus Company ‘Poppy Red’. 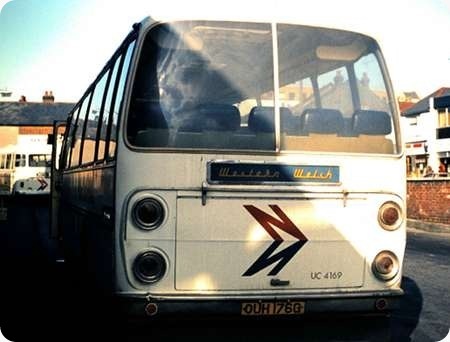 This was one of the two standardised NBC liveries (but there were exceptions) introduced from late 1972 under Chairman, Freddy (later Sir Frederick) Wood. Although these two NBC colours were actually British Standard colours and should have been the same on all vehicles, in practice, due to differing paint suppliers used by different companies there was actually some discernible difference between fleets. A belated thanks to Paul Lloyd and Rob F. for their answer to my ‘What colour question’. Poppy red it is and shall be so evermore. Well, Ed, not for evermore, because the Poppy Red usually faded into a strange and slightly odd pinky colour with the effluxion of time! Until it began to fade, as it very quickly did, and degenerated into "poppy orange". Regarding the yellow route numbers, the suggestion that they were specifically intended to identify one-man-operated services seems unlikely. You have to remember that, at that time, OMO (or OPO) was being introduced gradually – very gradually, in the case of some Western Welsh depots – so that it was very unlikely that any bus would have been used solely on OMO work. Even into the mid-1970s, the unions at some depots refused to allow OMO with any vehicle with more than 45 seats; at other depots, such as Cardiff, the larger single deckers could be OMO, but there were several crew workings which also used these vehicles, particular at less busy times. Most of the early Atlanteans were rarely, if ever, used for OMO. I suspect that the better contrast of yellow against a black background would have been the reason for using yellow numerals – although it would have been more logical to use it for all of the content of the destination blinds. However, it may have been more complicated to produce – as I understand it, the traditional blinds were white linen, with black paint. Thus, at night, the lights shone through the blind – but using yellow linen might have been more complex, or more expensive. Probably the latter! Yes Roger Cox and Chris Hebron, you are correct, I Forgot the Post Office van syndrome. I live in North Rd. Cardiff, and very occasionally I see a Western Welsh double decker heading Northward. Usually in the evening. Laugh you may, but to see this machine trundling out of the mist, a machine which was an integral part of my young days, and, I thought, gone forever, can be a little bit scary. Is this bus known to any of you bus people? I’d like to have a close look at it. See where we ‘fitters’ used to sit in the top deck, eating our sandwiches. Nigel Frampton and others earlier on, mentioned coloured blinds versus white lettering on a black background. Just after the war, London Transport’s Green Line services had traditional white on black blinds, with GREEN LINE added. Before long, the blinds changed to black lettering on a yellow background (minus GREEN LINE) and remained so thereafter. Of course, these services also had unique buses/livery/route number ranges/bus stop style, all of which would have helped potential passengers to use them.